Not very long ago the West Yorkshire city of Leeds was a grim, grey industrial town; however, in little more than a decade, Leeds has enjoyed an economic boom and its transformation has earned it accolades from all quarters. It is now recognised as one of Europe's most successful cities. Along with this boom has come regeneration and a fresh tide of tourism. 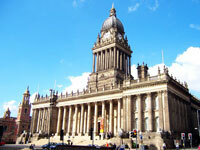 Leeds currently attracts about 20 million tourists a year, the majority of which are day-trippers. The reasons visitors come to Leeds are many and varied; its famously wild nightspots, frequent cultural events, abundant shopping and fascinating collection of museums are just a few. Sharing access to the nearby international airport is the neighbouring historic Yorkshire city of Bradford, also a vibrant, cosmopolitan city offering plenty to amuse and entertain visitors. Bradford has attractions like the National Media Museum, Industrial Museum, and a splendid art gallery contained in beautiful Lister Park. These two complementary Yorkshire cities, with their packed calendars of festivals and events, have become the beating heart of northern England. Visitors to the UK should not pass up the opportunity to visit Leeds, which has been dubbed the 'Knightsbridge of the North'.